The April 6 Youth Movement held a press conference on Thursday, calling for mass rallies on Saturday to mark the fifth anniversary of its inception and protest against Egyptian President Mohamed Morsi. Unlike the past years, the group – which is believed to be among the first youth movements to stand up to former President Hosni Mubarak's authoritarian rule – has announced that the day will be marked by strong protests to express dissent against President Morsi's Islamist-led regime, rather than by celebratory events. The group was officially established in the aftermath of the 6 April 2008 strike by textile workers in the industrial city of Al-Mahalla Al-Kubra to demand higher wages and better work conditions. The strike was believed to be the first mass public outcry against decades of autocratic rule under former President Mubarak, and one of the main catalysts to give rise to dissent, which set the stage for a popular uprising a few years later. Founding members of the group were amongst the main players who called for the Mahalla strike, which later escalated into a nationwide strike. The conference – which was held at the group's headquarters in Giza – was led by leading members of the April 6 movement, along with representatives from the Constitution Party, the Alliance of the Revolutionary Forces, and the Free Egyptians Party. "Amid the current political, economic and social turmoil the country has been thrown into, we have decided [for] the day to be a strong outcry against the failure of [the regime] to administer the country or meet the goals of the revolution," said Khaled El-Masry, media spokesman of the April 6 Youth Movement during the conference. On the official April 6 Youth Movement Facebook event page, the group presented four major demands: the release of detained activists, removal of the country's prosecutor-general, dignity for citizens, and downfall of the regime. Four major marches are scheduled for Cairo on Saturday. According to the media statement issued during the conference, marches – which will kick off at 4pm – will set out from Mohandeseen district's Mostafa Mahmoud Square, Dawaran Shubra Square in the Shubra district, central Cairo's Sayyeda Zeinab Mosque, and Giza's working class district of Imbaba. 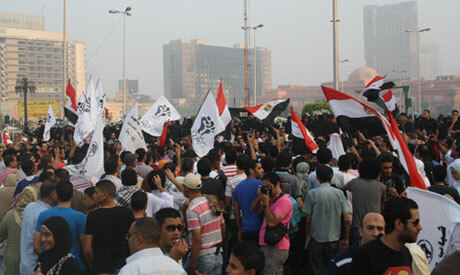 The destination has yet to be decided but initial plans suggest marches will meet in downtown Cairo's Tahrir Square. Additional rallies to protest Islamist rule are expected on Saturday in other governorates across the country, including Alexandria, Port Said, Mahalla and Minya. In a Wednesday statement, Egypt's Cabinet urged political forces taking part in the day to maintain the peacefulness of the planned protests, asserting that the day should be a commemoration to "celebrate and unite." "We supported President Morsi when he ran for presidency. Now, after he issued his constitutional declaration, rammed through a new constitution and failed to meet the goals of the revolution we have joined the ranks of the opposition," said Ahmed Maher, co-founder of the April 6 Youth Movement. Maher asserted the opposition will press on with efforts to overthrow a regime, which he believes "has not fallen on 25 January 2011." The interior ministry under President Morsi's Islamist rule is more brutal than during the autocratic rule of President Hosni Mubarak, Maher added. "As of [next Saturday] April 6, opposition forces will unite to fight for the downfall of the Brotherhood's rule," said Shady El-Ghazaly Harb, co-founder of the Revolutionary Youth Coalition and leading member of the Constitution Party. "Morsi is no longer our president. He doesn't represent us." Haitham El-Shawaf, general coordinator of the Alliance of the Revolutionary Forces, echoed the same sentiment of simmering discontent with the Islamist rule. "We seek to reproduce a revolution that is being put down by an authoritarian, fascist regime that has reared its ugly head," he said. Plans for anti-regime rallies come days after nine opposition activists and four lawyers were arrested in Alexandria – and less than a week after Abdullah launched legal proceedings against five prominent activists for inciting violence against the Muslim Brotherhood. Three members of the April 6 groups remain in custody, following a protest in front of the residence of Egypt’s interior minister in Cairo’s Nasr City district. They were arrested after chanting that the interior ministry was a “prostitute” and waving underwear. During the conference, prominent opposition figures lambasted what they described as brutality and abuses carried out against activists in detention. "Pre-trial detention has become a systematic new emergency law exercised by both the prosecution and the interior ministry. Activists are detained at illegal camps and are subject to torture," said Sayyed El-Banna, an April 6 lawyer. Egypt's opposition have warned of a recent crackdown on dissent by the country's Islamist government. The controversy over recent legal action against well-known activists and media figures adds to the range of challenges currently facing President Morsi, including the country's crumbling economy, plummeting tourism and tenuous security situation.